Martin Gould at the Daily Mail offers a piece on the grandfather of President Trump’s adviser (seen together in the above photo). 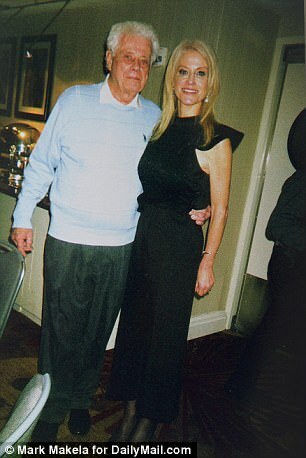 Kellyanne Conway's grandfather was not a Mafioso, her mother has exclusively claimed to DailyMail.com - instead he was nicknamed 'The Brute' because of his sheer strength. Jimmy DiNatale acquired the name because he once lifted two heavy truck engines onto his pickup by hand, his daughter Diane Fitzpatrick said. He knew mob figures, she admitted, but he was never one himself. 'Anyone who had spent time in South Philadelphia in those days would have known people in the Mafia,' she said. As DailyMail.com reported last month, DiNatale, who died in 1983, was named 26 times in a New Jersey Organized Crime Commission report, mainly for providing an alibi for Philadelphia mob boss Nicodemo 'Little Nicky' Scarfo and two associates who were suspected of the December 1979 gangland murder of Vincent Falcone. He told cops that he had been with Scarfo, Philip Leonetti and Lawrence Merlino in the Country Squire diner in Egg Harbor Township, New Jersey, at the time that Falcone was murdered.